In response to Donald Trump’s controversial comments on police brutality. On Friday, Donald Trump was invited to speak in front of a group of law enforcement officers at Suffolk Community College in Brentwood, New York. During his speech—which touched on murders committed by the MS-13 gang, border patrol and deportation—Trump seemed to publicly endorse police brutality. The Suffolk County Police Department (SCPD) immediately explained where they stand on the issue of police brutality in a few tweets. "The SCPD has strict rules & procedures relating to the handling of prisoners," they stated. "Violations of those rules are treated extremely seriously. As a department, we do not and will not tolerate roughing up of prisoners." Jeffery Robinson, deputy legal director at the American Civil Liberties Union (ACLU) and director of the ACLU’s Trone Center for Justice and Equality, recently shared his reaction to Trump’s speech in a statement posted on the organization's website. 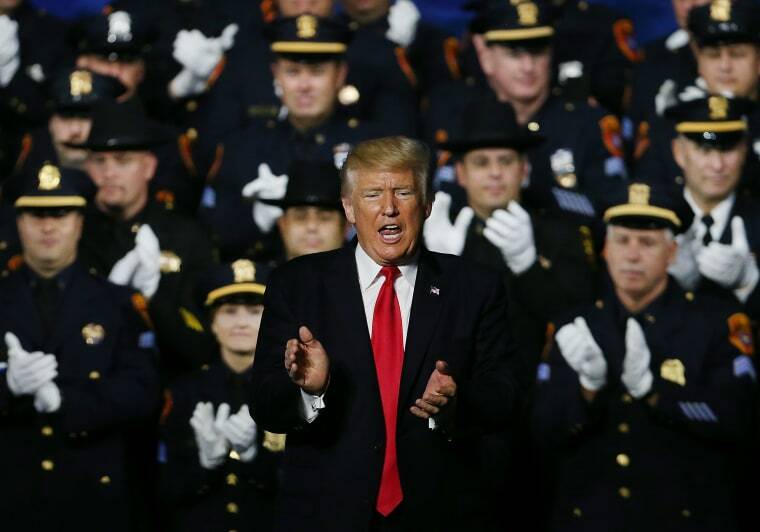 “The president today told a group of police officers, ‘We have your backs 100 percent,’ if they gratuitously hurt people whom they suspect of a criminal offense," he said. "By encouraging police to dole out extra pain at will, the president is urging a kind of lawlessness that already imperils the health and lives of people of color at shameful rates. Innocent until proven guilty? Our president would rather not bother with that, expanding the role of the police officer to include judge, jury, and executioner. New York Civilian Complaint Review Board Chairwoman Maya D. Wiley also commented on the issue in a press release. "President Trump’s comments fly in the face of the responsibility our City’s officers display in the line of duty. But for many communities in our City, President Trump’s comments only stokes fears of interacting with officers," she stated. "President Trump’s speech today was shameful, dangerous, and damages the progress our City has made toward improving police-community relations. No act of police violence or other misconduct, where proven, will go unanswered by the CCRB." Re-live the horror of Trump making misguided his remarks in the video, below.